Hand and Hand has been created with very little overhead thanks to the generous contributions from some amazing, creative folks. Now instead of cashing out with the revenue from sales, we are using each and every dollar toward the future of the magazine! Thanks to your patronage we've begun to save funds toward a printed version of Hand and Hand: The Knot, and contributor fees for the next issue. That's right – we want to pay creative folks around the world to share their love for making. Also, we're dying to keep our issues advertisement free, which means more great content for you. The fact is we can't do all of this without you. We're so grateful for all of the support we've received for our inaugural issue Hand and Hand: The Knot . To date you all have helped us reach our goal to purchase the appropriate ISBN numbers (for this issue and a few more), which means we'll be able to sell Hand and Hand across several additional platforms very soon. 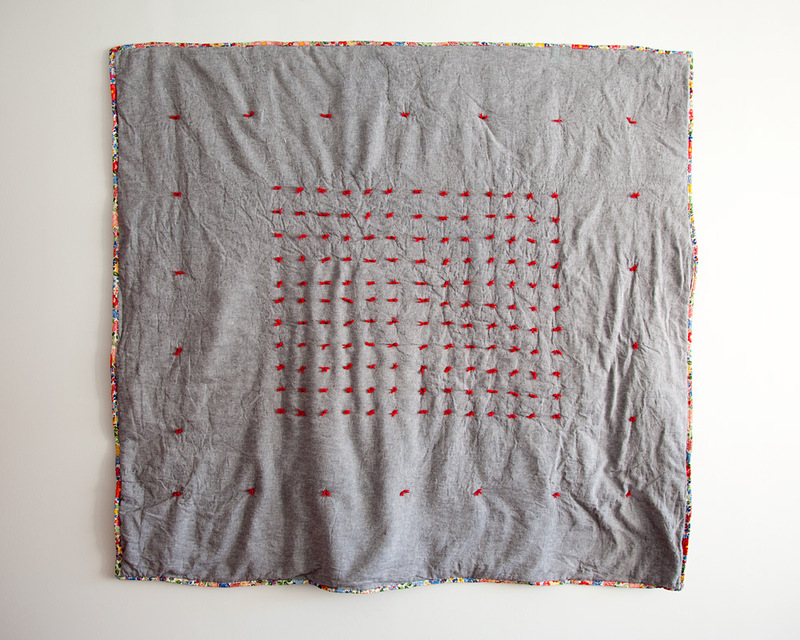 This simple quilt was the very first of the articles and projects for The Knot issue. Luxurious materials are used for this minimal play on the traditional tied quilt. 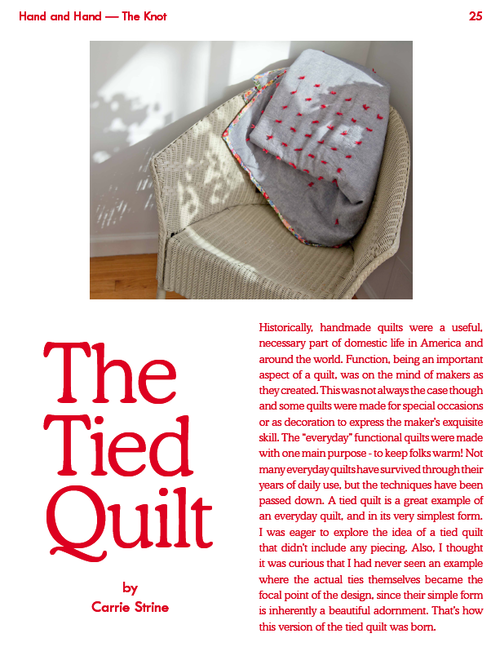 Here at Hand and Hand we think tied quilts get a bad wrap in the craft community because they're so easy to make. Instead we think their texture and simplicity – think form and function – ranks right up there with the very coziest of blankets. This project is an excellent first quilt, and can actually be completed totally by hand if you don't have a sewing machine. Only the binding requires any traditional stitching, the rest of the construction is exclusively knots! Now, if you're an experienced sewer, this is a super quick and fun project to tackle. You'll love the chance to play with the materials we have selected. Read a bit more about this project on Carrie's blog, and get your hands on The Knot issue to make your own. Making some of the projects in this issue? Join the community with the tag #handhandmakes. 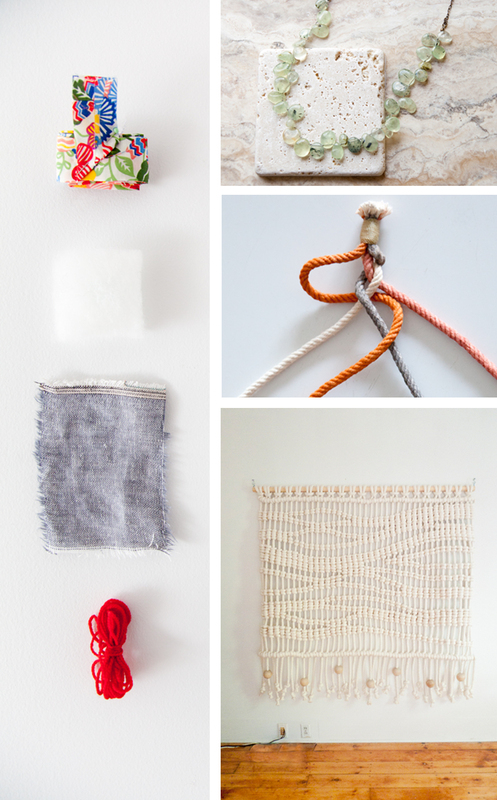 Hand and Hand: The Knot includes a beautifully inspired pillow project by Jessica Marquez of Miniature Rhino. Her delicate ode to the french knot, is just as much a conceptual project as much as it is a playful, simple use of this lovely embroidery stitch. 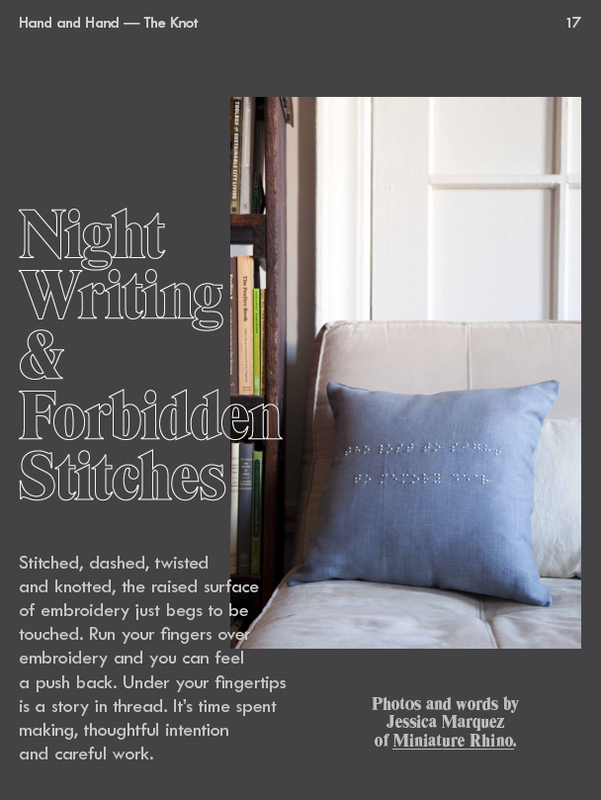 Making the connection between braille and the french knot, transforms a simple embroidery into a loving tribute to the sense of touch. Check out Jessica's words, more photographs, and a how-to in this issue! Our very first issue of Hand and Hand, The Knot, is available to download onto your favorite device for summer making and inspiration. Buy your copy today in our shop. We're putting the finishing touches on our first issue The Knot , and are incredibly excited to announce that the issue will go on sale next Tuesday, June 25th at 12p ET. Working on this first issue has been a wonderful lesson for Tim and I in the generosity and excitement of our community. We hope this issue reflects to everyone the inspiring, creative conversations we've had about knots together over the past several months with this talented gang of contributors.